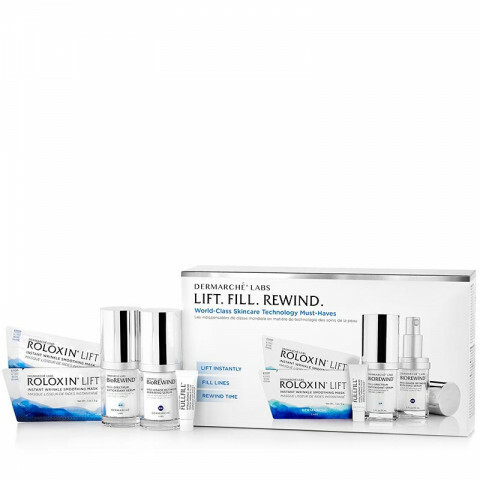 THREE WORLD-CLASS TECHNOLOGIES FROM THE DERMATOLOGY EXPERTS: Lift Instantly with Roloxin Lift: For an instantly firmer, smoother, lifted look that lasts all day; Fill lines with Fullfill: A topical wrinkle filler with revolutionary injectable size Hyaluronic Acid, clinically proven to reduce the appearance of deep lines and wrinkles on the most stubborn facial areas. Rewind Time with BioREWIND: BioREWIND Full Spectrum Anti-oxidant Serum (AM): A proprietary antioxidant blend that redefines protection against free radicals. BioREWIND Pro-Grade Retinoid Repairing Serum (PM): A professional strength retinoid that provides maximum effectiveness with minimal irritation. gifted this set to my mom for the holidays. she loved it. great way to get deluxe sample sizes of the roloxin skincare products. great price! this set is great for beginners and those who want to start using dermarche products. great value for the size of the products included.